Auto Glass Repair. Quality Windshield Replacement Just $160. Windshield Replacement Starting at Just $160! Advanced Driver Assistance Systems (ADAS)! "Great Service, Great Employees! Bob called on his way, was done quickly and efficiently! Very Satisfied, will refer others." "Fast and affordable. Great customer service. Picked up my car from work and dropped it back off when it was done." "Hands down best place for Auto Glass replacement. Best pricing around, fast,friendly, convenient, and professional!" "These guys did a great job, they were prompt and very reasonably priced. Overall great experience. Thank you." We work with all major insurance providers to give you the best deal on your windshield repair. Restrictions apply. Foreign and Domestic Cars, Trucks, Vans, Semi-Trucks, Motorhomes and More. We'll even come to you. Warranted against defects in material or workmanship for as long as you own the vehicle. Warranty terms apply. Auto Glass Repair by Action Glass. If you need a new auto glass repair or windshield replacement, let Action Glass serve you! Whether it's a car, truck, SUV, or motor home, we will come to you and get the job done right. We can even bill your insurance directly, so you don't have to deal with it. We meet or beat all competitors prices on auto glass repair! We've been in the auto glass repair business for over 30 years! If you have any general questions about auto glass repair and replacement in Grand Rapids and West Michigan, click here to contact us! If its cracked, your windshield needs to be replaced. Let us handle the hard work, at our place or yours. Sometimes your windshield can be repaired instead of replaced. We'll tell you when that is the case. Damage doesn't just happen to your windshield. Let us replace that busted side glass so your family stays safe. If your rear window is broken, you'll have a significant visual impairment when driving anywhere. Call us today. Don't wait - your safety might depend on it! 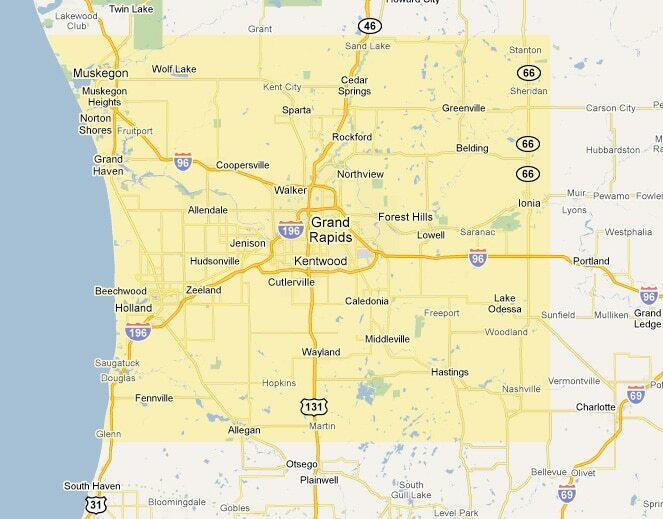 Windshield Replacement in Grand Rapids and all of West Michigan - We come to you! Action Glass serves the greater Grand Rapids auto glass repair needs, West Michigan area including Jenison, Grandville, Wyoming, Kentwood, Hudsonville, Jamestown, Borculo, Zeeland, Holland, Allegan, Fennville, Saugatuck, Hamilton, Dorr, Byron Center, Caledonia, Alto, Alaska, Cascade, Ada, Lowell, Ionia, Belding, Rockford, Cedar Springs, Sand Lake, Sparta, Peirson, Grant, Grand Rapids, Ravenna, Walker, Standale, Comstock Park, Kenowa Hills, Coopersville, Allendale, Nunica, Muskegon, Twin Lakes, Grand Haven, Spring Lake, West Olive, Olive, Allendale, Wayland, Gun lake. The map below shows our general service area. Call for details!